The Massachusetts senator’s aides have been quietly shopping for presidential campaign headquarters space in the Boston area. When and if she does, she’ll be rolling out arguably the most advanced and sweeping infrastructure in the Democratic field, a plug-and-play campaign that could give her a massive head start on nearly every contender in the burgeoning primary roster, with only Sens. Bernie Sanders (I-Vt.) and Kamala Harris (D-Calif.) coming close. 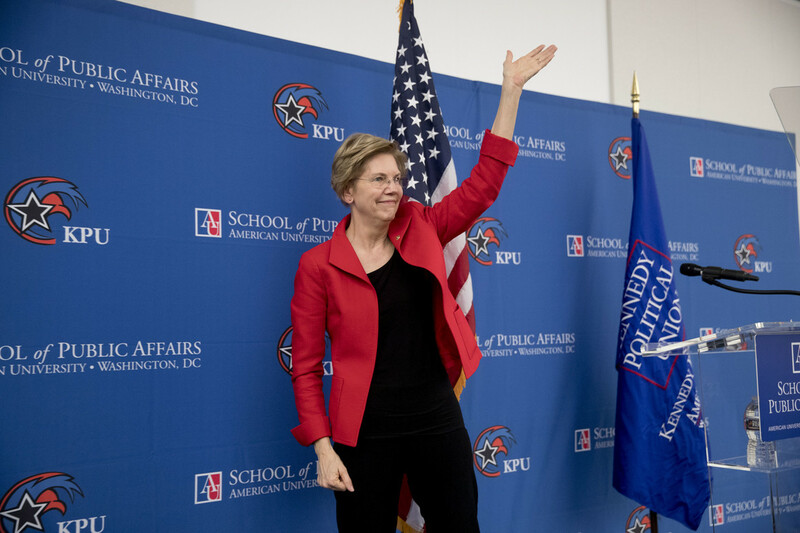 So far, Warren has merely said she would “take a hard look” at running for president. People with knowledge of her strategy said she has not yet made a final decision but if she joins the field, Warren will be among the earlier candidates to announce. In the five weeks since the midterm elections, Warren has operated like a candidate. She began interviewing national operatives for senior positions in a possible presidential campaign since before the midterms. Currently there are discussions with veteran early-state political operatives, including in Iowa, about the possibility of signing on, though no contracts have been yet signed. And if Warren moves forward with a presidential bid, she will do so with the nucleus of a team she’s trusted for years and build from there, sources with knowledge of the operation tell POLITICO. One major player already is Dan Geldon, a longtime Warren staffer and onetime Harvard Law School student under Warren who also served as her Senate chief of staff for three years. Sources with knowledge of the campaign say the senator is eyeing Geldon to take on the role of campaign manager. Other core staffers likely to be part of a Warren presidential team are finance director Michael Pratt; former Harry Reid aide Kristen Orthman, who handles communications; Gabrielle Farrell, who most recently headed communications for the New Hampshire Democratic Party; and Roger Lau, the campaign manager for Warren’s Senate reelection who also has New Hampshire experience. The campaign-in-waiting is working with the mail firm Deliver Strategies, and the digital firms Bully Pulpit and Blue State. Just below the top ranks, the Massachusetts senator has a nearly full-blown enterprise prepped for deployment: more than 50 people were reported on Warren’s latest campaign payroll, which counts field workers. In addition to that, several dozen more staffers who assisted Warren in her Senate campaign and were part of the Massachusetts Democratic Party payroll could be tapped to move into a presidential campaign. The senator herself has been busy personally calling scores of Democrats in the four early presidential states of Iowa, New Hampshire, South Carolina and Nevada, reaching out to former and recently elected officials, those who ran for office unsuccessfully, labor leaders and grassroots activists. A person with knowledge of Warren’s strategy estimated she contacted some 100 people in the early presidential states since the midterms. Warren invested heavily in the midterm elections, even as she was running for reelection back home, raising or donating nearly $11 million on Democrats. She deployed staff to each of the early states, sent out emails on behalf of midterm candidates and recorded a video to Iowa Democrats, urging them to vote. What Warren didn’t do, however, is actually visit Iowa or New Hampshire, unlike a slew of the potential candidates with whom she’ll likely compete. But unlike many of them, she had a reelection campaign back home in 2018, and a need to show strength in her home state performance. Strope-Boggus said she never reconnected with Warren by phone but noted that she’s already personally met several 2020 potential candidates, including Harris, Oregon Sen. Jeff Merkley, California Rep. Eric Swalwell and New Jersey Sen. Cory Booker, among others. Booker not only took a selfie with her, but later mailed her a copy of the photo complete with a personal note of thanks. The senator’s effort backfired, only bringing more attention to the issue and leading Democrats to accuse Warren of playing right into Trump’s hands. At home, where she was recently elected to a second term, there are few signs of an outpouring of support for a 2020 bid. A September poll of Massachusetts voters showed only 32 percent wanted her to run for president, compared to 33 percent favoring a run by former Sen. John Kerry, and 38 percent saying former Gov. Deval Patrick should launch a presidential bid. While Patrick’s decision last week to bow out of the 2020 race was viewed as a potential benefit to Warren, freeing up Massachusetts-based operatives, donors and activists who might have otherwise been conflicted over the two, any relief was short-lived. Two days later, the Boston Globe — her hometown paper, with a circulation that reaches into New Hampshire — panned her White House prospects. Previous article‘Start Here’: Cohen, Manafort, Kelly, Ebola. What you need to know to start your day.